There are certain things I just know that I like. Red nails. Gramma’s house in Montauk. Pancakes and French pastries with extra syrup and jam. The act of re-reading any and all Harry Potters (except maybe number five — Harry’s angsty teenager act stresses me out in that one). New running sneaks. Getting flowers! Clean sheets. Amazing/terrible pop music. Thanksgiving! Also chocolate. And now, apparently, lemons? I don’t know. I mean, lemons. I didn’t used to think the sight of a pile of lemons on the counter would excite me, but here I am again, singing the praises of yet another lemon recipe. I’ve made lemon curd (twice, actually – the second time I turned it into lemon yogurt mousse), lemon muffins, um, twice, lemon loaf cake, lemon yogurt cake (one of my first ever blog posts, by the way — how far I’ve come since then), and lemon-scented banana bread. And now ice cream! I am lover of lemons and a maker of lemon cream ice cream. Yes! Loud and proud. 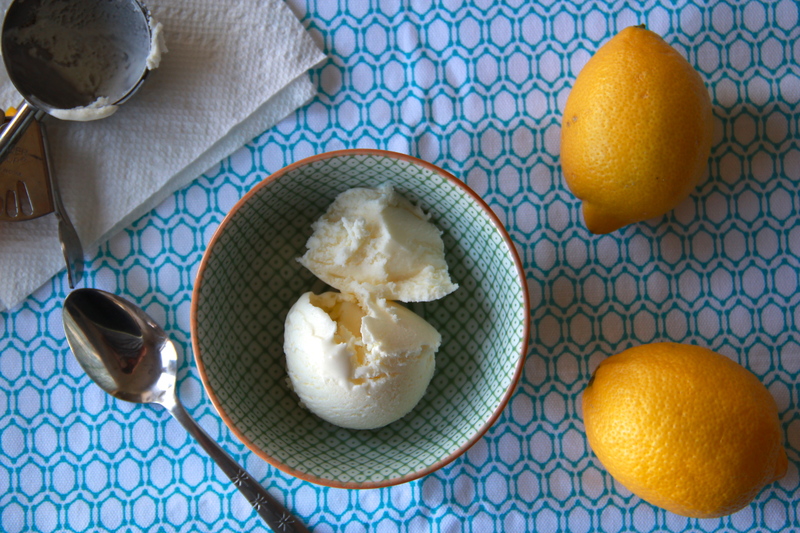 You don’t see a lot of lemon ice cream out there. 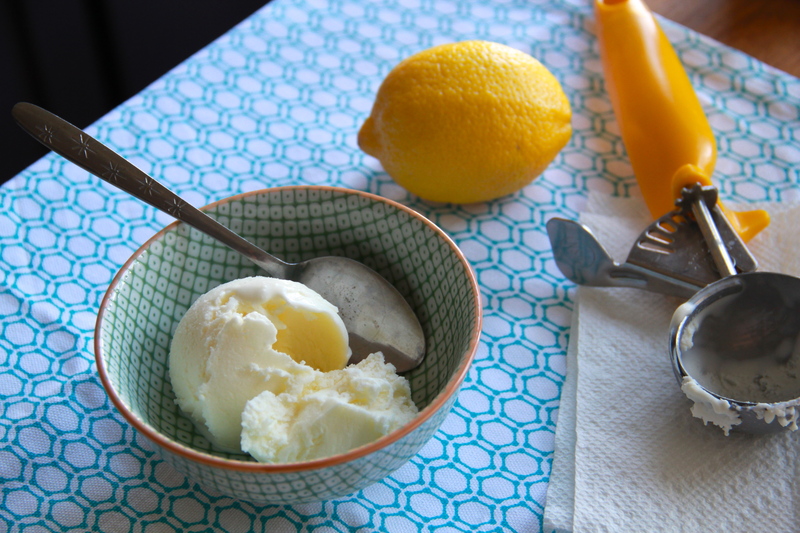 Lemon sorbet, sure, and the occasional lemon Italian ice (or water ice in Philadelphia), but it’s rare to find smooth, creamy, true ice cream in bright and refreshing lemon. But let me tell you: it exists, and it is fantastic. Enter: Jeni’s Splendid Ice Cream. Have you heard of this? It’s a thing. Jeni is kind of a big deal. Get familiar! Jeni’s ice cream recipes are totally easy. They’re eggless, so we don’t need to worry about separating yolks from whites and maybe not paying attention to the creme anglaise-making process and subsequently curdling our eggs because we’d rather just sing along to the soundtrack from Pitch Perfect — does that ever happen to you? No? Okay. Well. That sort of thing is not a problem here. And Jeni’s ice creams are extra rich and creamy because she adds cream cheese to the base. Cream cheese! Genius. I don’t make my own ice cream that often, but every time I do I wish I did it more. Make this one, and I bet you’ll feel the same. Lemon lovers (or Harry Potter lovers, maybe) unite! To make the syrup, use a vegetable peeler to remove the zest from 2 lemons in large strips; reserve. 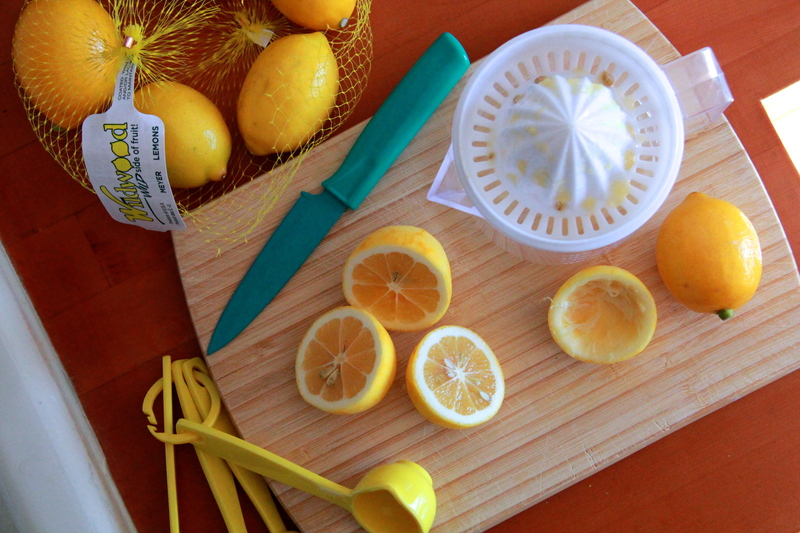 Halve the lemons and squeeze enough juice to make 1/2 cup. Combine the juice and sugar in a small saucepan and bring to a simmer over medium heat. Stir until the sugar is dissolved, then remove the syrup from the heat and refrigerate until chilled. To start the ice cream base, whisk the cornstarch into 2-3 tablespoons of milk in a small bowl, until smooth. In a larger bowl, whisk the cream cheese and salt together until smooth. Fill a large bowl with lots of ice and water. Combine the remaining milk, cream, sugar, corn syrup and lemon zest in a large (4 quart) saucepan. Bring the mixture to a rolling boil, and boil for 4 minutes. Remove the pan from the heat and gradually whisk in the cornstarch slurry. Place the pan back on the heat, and bring it back to a boil, stirring with a heat-proof spatula, until slightly thickened, about 1 minute. (You’ll know it’s thick enough when it coats the back of a spoon and your finger leaves a clear, non-runny line when swooped across — the French call this nappant.) Remove the mixture from the heat. Gradually whisk the hot milk mixture into the cream cheese mixture until smooth. Pour the ice cream base into a 1-gallon zip-top freezer bag and submerge the sealed bag in the ice bath. Let stand, adding more ice as necessary, until cold, about 30 minutes. Remove the strips of lemon zest. Pour the ice cream base into the frozen canister of your ice cream machine, and turn it on. Pour the lemon syrup through the opening in the top of the machine, and continue to spin the ice cream until thick and creamy. Pack the ice cream into a storage container (it will make about a quart), press a sheet of parchment paper directly against the surface, and seal with an airtight lid. Freeze until firm, at least 4 hours. Makes about 1 quart ice cream. Lovely recipe for kicking off the summer. Enjoy your weekend too, my friend. you are simply amazing, chef molly! Terrific. I agree that Jeni’s ice cream base is delicious. I just discovered your website and I love it!